Though it’s unlikely you noticed, the Apple Store underwent a redesign last month: new home page, information architecture, category pages, and product features. Given the number of languages, countries, and institutions (educational and corporate) with their own version of the Apple store, there’s no doubt this was a large-scale undertaking. Yet, almost no one noticed. To bring it back to the quote that started off this post, many people will argue that great design is nearly invisible. In the case of the Apple store, lots of changes were made but Apple’s customers just continued about their business. They likely felt so at home, they couldn’t identify what’s changed. On a related note, it’s interesting to note the differences between Apple’s commercial storefronts and lifestyle applications. 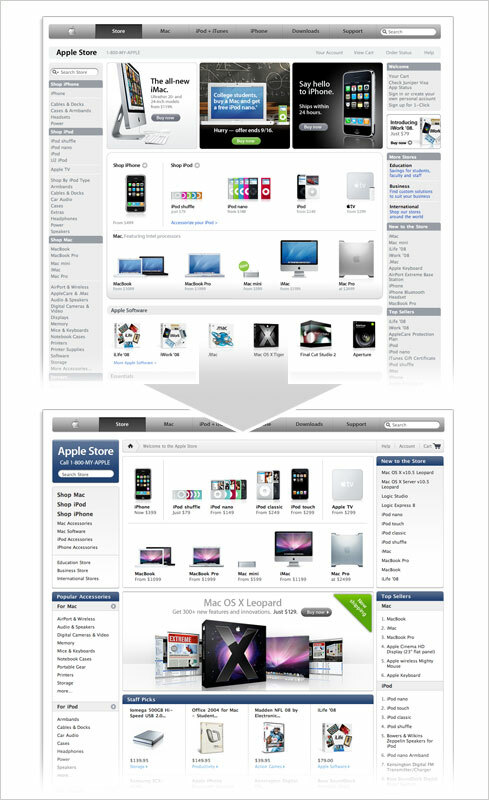 The Apple Store and the iTunes store both feature many browse paths, product promotions, and calls to actions. One could even say these experiences are quite busy. On the other side of spectrum, iPhoto and iTunes feature a minimum set of actions and really let their content take center stage. Extreme almost minimalist restraint in one set of products -awash with commercial eye candy in the other.